These images are part of a large collection of fifty city maps tracing geotagged photos from Flickr and Picasa. Eric Fischer determined the speed at which photographers travelled the various urban landscapes by analyzing their photos' timestamps and geotags, and plotting them on an OpenStreetMap background layer. 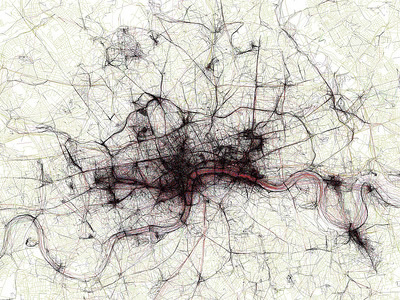 The maps are ordered by the number of pictures taken in the central cluster of each city, and include various metropolises like New York, London, Paris, San Francisco, Tokyo, Berlin, Rome, Barcelona, Vancouver, and Hong Kong. 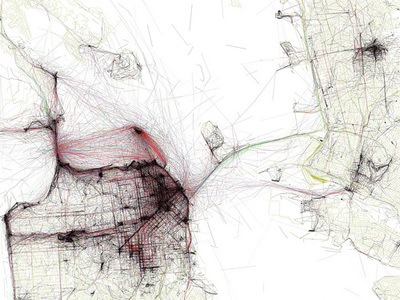 The first map is from the city of London and the second from San Francisco.